We were fortunate to have CBC Manitoba join our Dragon Boat team for their last practice of the year! Manitoba Blind Sports Association hosted the 2017 Western Blind Curling Championships in March 2017.
drummer who sets the pace. Paddlers provide the power to move the boat. higher level can also compete at the Westerns and Canadian Open. Westerns and Nationals held in Ottawa during White Cane Week. 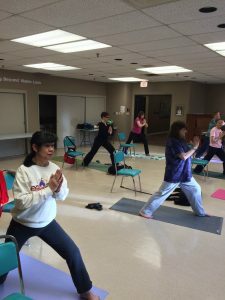 The Manitoba Blind Sports Association Yoga Program is for all fitness levels and focuses on increasing your body’s flexibility and core strength. Practitioners have the potential to develop skills that will enhance physical health, confidence and mental wellness. Yoga is a low impact workout that will add balance to your life! Every workout adapts for participants to improve balance, stability, flexibility and strength using mindfulness and breath. Although you may start yoga for the physical benefits you may soon feel the bonus of an overall sense of well-being. This group practice is a fun and safe environment where participants support each other with positive feedback, enthusiasm and energy. 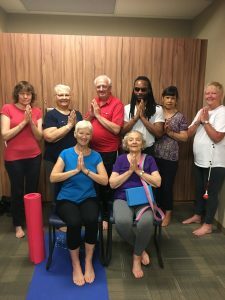 Lead by yoga teachers Ruth Reis, Doreen Wuckert, and Nicole Necsefor our classes run Tuesdays and Thursdays 10-11am at the CNIB Multipurpose Room located at 1080 Portage Avenue. Contact Cathy Derewianchuk at Manitoba Blind Sports Association for details about joining the classes. Ruth Reis has taught various group fitness classes for over 30 years and yoga for ten years, teaching at the CNIB since 2015. Her initial yoga teacher training was with Maureen Rae Studio in 2008. She certified as a fitness leader at the YMCA teaching various fitness classes throughout Winnipeg and later joined and certified her fitness and yoga with the Manitoba Fitness Council (MFC). In 2008 she took the NCCP course while teaching Taekwondo. Currently Ruth’s interests are focused mainly on yoga, teaching various classes for the City of Winnipeg as well as other venues throughout Winnipeg. Doreen Wuckert is a teacher by profession. Also, she is a certified Yoga and Resistance Instructor, receiving her training from the Manitoba Fitness Council, Yoga Studios in Toronto, and the Yoga Centre, Winnipeg. 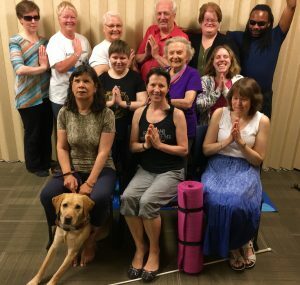 In addition to teaching with Maniotba Blind Sports Association, Doreen currently is a yoga instructo with the City of Winnipeg, Creative Retirement, Deer Lodge Community Centre, and leads private lessons in her home studio. Doreen refreshes her skills by taking new courses in Winnipeg and in other countries. She presents workshops upon request. Nicole Necsefor has been exploring the practice and teachings of yoga for the last ten years, completing various teacher trainings along the way. She currently holds Advanced Masters’ Core certification through the Yogic Physical Culture Academy, RYT200 Vinyasa Flow certification through Yoga Alliance, as well as YogaFit certification through the Manitoba Fitness Council. She believes in empowering her students to claim their own practice by cultivating a safe and inclusive space to explore all the benefits that yoga has to offer.